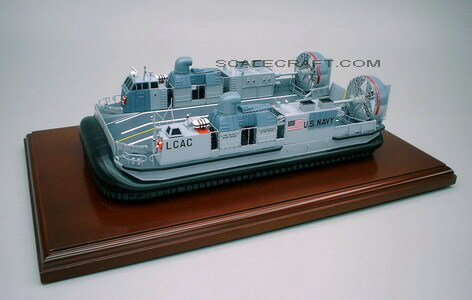 The Landing Craft, Air Cushioned (LCAC) is a class of air-cushion vehicle/hovercraft used as landing craft by the United States Navy and the Japan Maritime Self-Defense Force (JMSDF). They transport weapons systems, equipment, cargo and personnel of the assault elements of the Marine Air/Ground Task Force both from ship to shore and across the beach. Mahogany Wood. Scale: 1/72. Length 14 1/2 inches.